The Horse was and remains extremely important in human culture. Urban societies sometimes forget the great debt we owe to hoses and horsemen, and the very real and live continued importance of the horse in modern Society. We can bring this to life for the public or your clients and tailor such an exhibition to your requirements. If you are a Public Gallery or Exhibition Space looking for an insightful exhibition with an educational or historical context we can we can easily gear up an exhibition of our serious artwork to fit your needs. We could, if required provide sound and vision aids to give a thrilling, interactive experience to the visitor. In a time when human spirits need a lift, the horse, in all cultures has often been the symbol of that. And in today's economic and tense climate of mistrust that is all the more potent. Booking this exhibition/residency can make a positive difference in doing just that. •	Film slide and power point presentations to the public, etc. 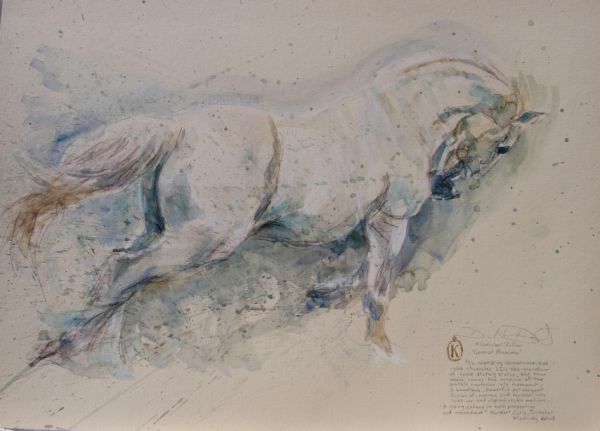 Our exhibitions can be based on our own work or they can feature a collection of popular Equine Art in general. It could be racing-based or horse-based. If Art based, we suggest the exhibition title "Studying The Form: The Horse through the eyes of artists DM and AJ Dent"
If Horse based, use a title something like "Equus". For either concept, we are able to book farriers for displays, guest speakers such as jockeys; and even arrange for Horses and hunting hounds to be brought to suitable locations. We have good experience of public space exhibitions and residencies in Europe. We have mounted exhibitions in the public areas of flagship buildings of Corporations such as Ceska Pojistovna; through to veterinary centres and Racecourses. On board our team is a former media officer used to staging and publicising high brow exhibitions at the Royal Geographic Society. Any exhibition can be accompanied by a short Artist residency. David and Adrian Dent are experienced at lecturing in schools and further education institutes in both Art and areas of equine education particularly in anthropological and historical areas of study; so classes for public and workers can be facilitated in either or both areas. David; a qualified teacher with a BEd Honours, is experienced in tutoring drawing from life. We can therefore facilitate the drawing the form of the horse from life in suitable locations. This tutorial from one of the UK’s most renowned equine and figure artists would be a unique opportunity. If you require figure drawing tutorials as part of the artist residence, we can provide tuition with David’s partner Eliza, who also models for The Royal Academy; Hesketh Hubbard at the Mall Galleries, Central St. Martins ; The Princes Drawing school and the famed London Sketch Club in Chelsea. David's couture company, PonyGurl Couture, which he sees as an extension of his Art. The Equine themed designs draw on traditional and sustainable materials rooted in tradition. Materials are sourced from rural and Hunting cultures. The idea is to also return to elegant dress forms made from natural materials (eg tweed) - long associated with the horse and predating corporate mass clothing production. So even fashion shows can be staged which we have done very successfully: in one case raising £40 000 for the Spinal Injuries Association. Having also staged fashion shows and bands, the Dents are also used to promoting a show through various street ideas such as parading horses and live public art demonstrations; so we can bring the public to the expo. Variables include residency length; insurances, international sourcing /transport; security etc. We have full supporting print and card and poster stock sale or return to support covering some of your costs. We can also translate exhibits into Russian French German Welsh Czech Polish Bengali Arabic Chinese and Bangladeshi through our team for a full on multi cultural experience.